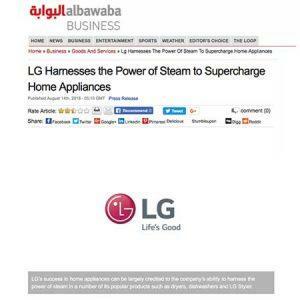 Great article published by Albawaba Business online news about the innovative features of the LG TrueSteam™ technology which is used in many of the popular LG appliances such as the LG Styler. The LG TrueSteam™ solution removes threats such as allergens and bacteria with high-temperature steam from pure water. TrueSteam™ is one of the most effective ways to kill germs. A steam generator in LG’s washing machine heats water to 100°C, making it hot enough to eliminate bacteria and even allergens from pet hairs, dead skin cells and mold. LG’s TrueSteam technology not only removes 99.9 percent of allergens but also the residue left by dead allergens. In fact, the LG Styler has earned the asthma and allergy friendly® certification for its superior performance in ridding fabrics of allergens.